It is important to slowly allow your foot, ankle knees to get adjusted to your new orthotics. 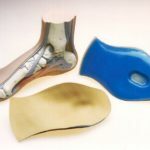 Just like an exercise program, you must slowly begin use of your new orthotics. Please follow the few simple steps below and your results will come quick. Wear your new orthotics for one (1) hour on the first day and increase wear time by approximately two (2) hour increments each successive day. After approximately seven to ten (7-10) days, you should be wearing the arch supports the entire day. If you have a low or “flat” arch it may take a little extra time to adjust to the new support. Some people may experience minor discomfort when they first begin to use their new supports. This is normal and typically means that your break in time will be greater. Please take the time to allow your foot function and biomechanics to adjust to the new control and support.